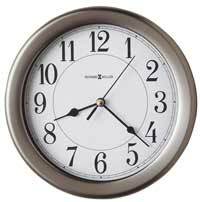 The Howard Miller Amanda is the 77th Anniversary wall clock edition that offers both substance and charm. The gently scalloped arched bonnet is supported by reeded columns with artfully turned caps. Finished in Golden Oak on select hardwoods and veneers. Behind the opening door, the off-white dial features black Arabic numerals, black serpentine hour and minute hands. A polished brass finished lyre and bezel provide the perfect accents to the warm wood case. Swinging pendulum. 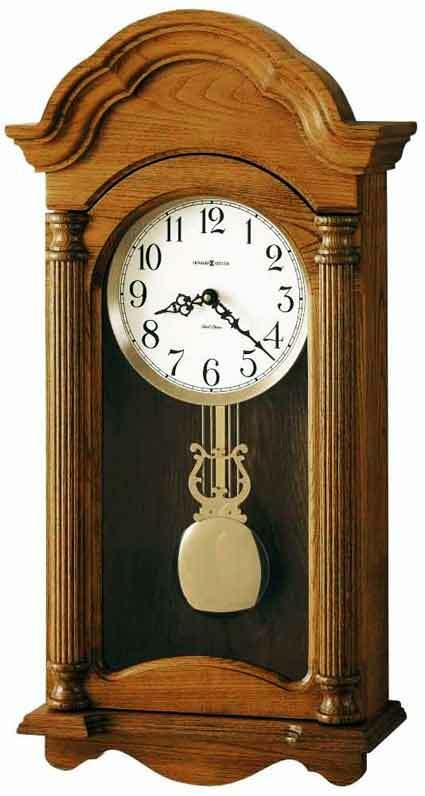 Quartz, dual chime movement plays Westminster or Ave Maria chimes and features volume control and automatic nighttime chime shut-off option. Chimes may be switched to quarter hour or hourly only melodies. Powered by 2 "C" batteries. Size: Height 25-1/4", Width 12-1/2", Depth 5". 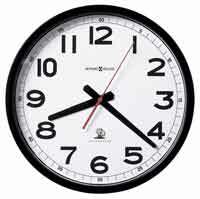 Clocks for sale at The Clock Depot including the 625-282 at discount prices.